This is the Town where most everything happens. 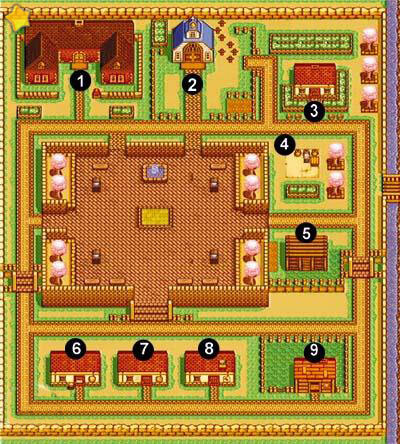 The Majority of the villagers spend their days somewhere around town. 1. Mayor's House: This is the Mayor's Mansion where the Mayor, Mayor's Wife and Maria live. 2. Church: This is the Church where the Priest and Church Boy live. Maria spends most of her time here. Come to church on Sundays to pray. 3. Flower Shop: This is where Nina's Mother and Nina live. Come here to buy Seeds and flowers. 4. Market: Sell all of your produce here on the weekends to the Peddler. 5. Fortune Teller's House: This is where the Fortune Teller and her Grand Daughter live. Come here to learn things about Love, Farming, and Animal Care. 6. Bar: This is where the Bartender, Eve, Eve's Mom, and Eve's Dad live. It is closed on Sundays. Come here at night after 6:00 PM to get a quick drink after a long days work. 7. Restaurant: This is where Ellen, Ellen's Dad, Ellen's Mom, and Ellen's Grandfather live. Buy Cakes here which you can eat or give away to the villagers. 8. Tool Store: This is where Ann and Ann's Father live. Come here to buy Tools and other Items. 9. Livestock Store: This is where Ellen's Uncle lives and works. Come here to buy or sell Animals and other items.